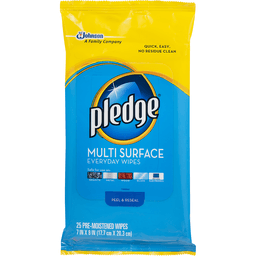 Pledge® Multi Surface Wipes Fresh Citrus. SC Johnson - A family company since 1886. 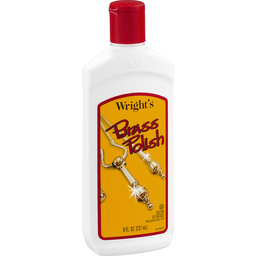 3x Better removal of dust & messes*. Everyday cleaner. Granite + Metal + Wood + Glass + Electronics. 25 Pre-Moistener wipes 7 in x 8 in (17.7 cm x 20.3 cm). The Fresh Citrus fragrance invigorates your home with the crisp scent of oranges while you dust and clean. Surface: Wood. Wood laminate. Glass. Mirrors. Stainless steel. Plastic granite. Marble chrome. Electronics and more. Removes: Dust & messes. Fingerprints smudges. Smears. No residue! 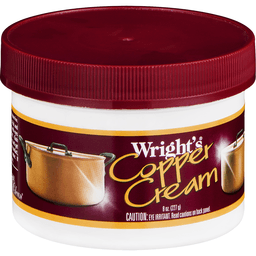 This formula is not sold to any retailer as a store brand. Try Pledge® Multi Surface Everyday Cleaner, featuring popular Glade® fragrances. 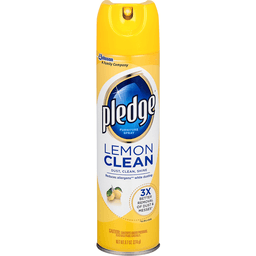 For even more shine & protection try Pledge® Lemon Clean wipes! *Vs dry cloth. Environmental facts: Contains no ammonia, bleach, phosphorus or dyes. This product was not tested on animals. All rights reserved. Questions Comments Call 800-558-5252 or write Helen Johnson. Visit us at www.pledge.com, www.scjohnson.com. ©2013 S.C. Johnson & Son, Inc.
Weiman®. 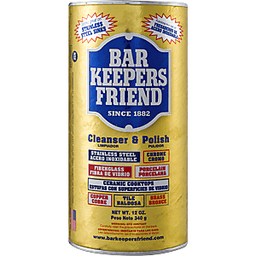 Streak Free Stainless Steel Cleaner & Polish. Limited warranty to consumers. Good housekeeping. Since 1909. Replacement or refund if defective. 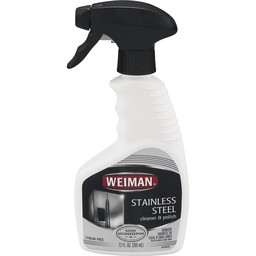 Weiman® Stainless Steel Cleaner & Polish is specially formulated to clean, shine and protect stainless steel. 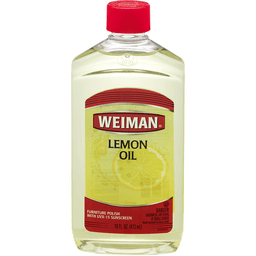 Removes fingerprints, smudges, residue & grease. Protective coating repels dust & dirt. Leaves a brilliant, streak-free shine. 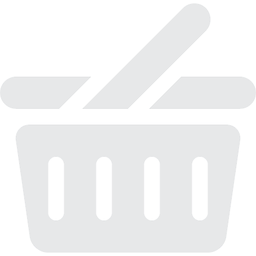 Recommended for: kitchen appliances, countertops, sinks, range hoods, backsplashes & grills. Weiman® proudly supports the national ovarian cancer coalition. To learn more visit: www.ovarian.org. Phosphate free. The Good Feeling of Clean®. (800) 837-8140. www.weiman.com. Endust® Multi-Surface Dusting Spray Perfume Free. 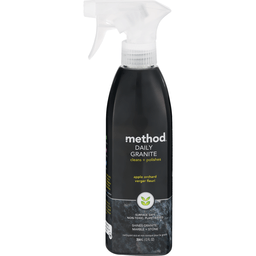 Removes up to 92% more dust mite allergen*. Dust & clean fast. 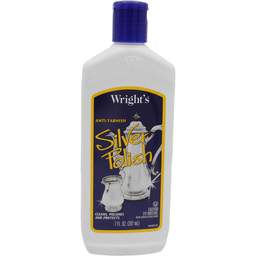 Removes dust, fingerprints, allergens and smudges. Leaves natural shine. Hypo-allergenic. Certified asthma & allergy friendly™. 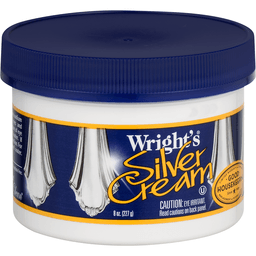 Net Wt 10 oz (284 g). 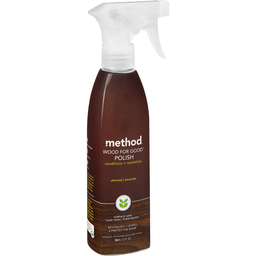 Hypo-allergenic Endust free is the first furniture spray certified asthma & allergy friendly.™ *Removes up to 92% more dust mite allergen than dry dusting. Reduced-mist spray. Less irritating ingredients. Removes dust, fingerprints and smudges. Multi-surface convenience: Endust's unique formula works just about anywhere dust collects, including non-wood surfaces: Furniture. Cabinets/Counters. Floors. how2recycle.info. Endust is a trademark of Nakoma Products LLC. Questions about Endust Call us toll-free: 1-855-ENDUST1. www.endust.com. © 2014 Nakoma Products LLC.